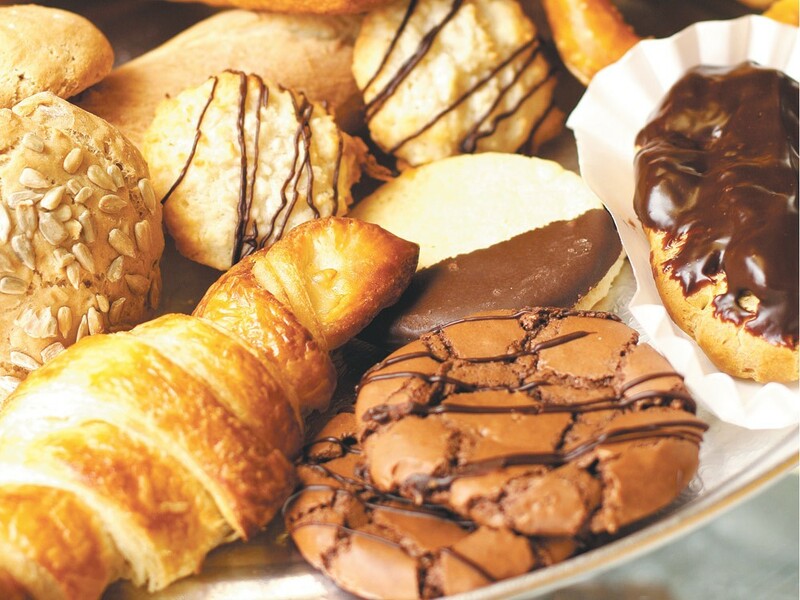 In Kettle Falls, Uphaus Bakery brings German baking stateside. The Uphaus family puts a German spin on everything from cookies to rye bread. It’s a quiet, cold Monday afternoon in Kettle Falls, Wash., but not inside the tiny, toasty Uphaus Bakery, which is packed with people chattering away in German. Owner and primary baker Alexandra Uphaus greets us and then proceeds to give the grand tour while simultaneously introducing us to her entire family. In addition to her mother tending the front, Alexandra’s father can be found in the back office, setting up a new computer by a cozy electric fireplace. And the guests who met us by the entrance? Her brother and grandmother, who have just flown in from Germany. A curious passerby enters the shop and checks out the fare. After inquiring about a couple items, she mentions her German ancestry and, with little coercion, decides to order half the remaining stock in a half-English, half-German hybrid. Uphaus Bakery has only been open four days now, and the draw of this small, family-run bakery has already won over dozens of customers. Though Germany is easily associated with wurst and schnitzel, it is a bit more difficult to pin down which sweet things can be attributed to the country. Uphaus Bakery features some easily recognizable treats from its owner’s home country, such as the towering, kirsch-soaked Black Forest cake. Fans of this would also appreciate her peach donauwelle, a marbled cake layered with peaches, custardy buttercream and dark ganache. Their signature German pretzel, is soft, yeasty and tangy with just the right amount of coarse, crusty salt coating the lacquered exterior. It puts those pretzel kiosks at the mall to shame. “I hide in the back when dipping them in the lye, so the customers don’t think I’m doing some crazy experiment back here with goggles and gloves on,” jokes Uphaus, a former baker with the Davenport Hotels. Lye? Like the stuff people use to dissolve bodies, make meth and clear drains? This is food-grade lye, Uphaus explains, an extremely diluted solution that can be used for dipping the pretzels. The brief chemical bath results in the pretzel’s attractive brown crust, sheen and characteristic flavor. As for breads, Uphaus believes rye rules over all flours. Light rye is present in all the featured loaves, lending them a mild malty flavor and chewy texture. The dense, seed-studded, fiber-packed vollkornbrot (multigrain bread) requires two days of fermentation and kneading before it sees the inside of an oven. The end result is a heartier, chewier version of sourdough. The humble culinary roots of Uphaus Bakery can be traced back decades to the quaint little town of Bielefeld, a city best known for a bizarre Internet conspiracy that maintains Bielefeld doesn’t actually exist. The family’s origins are immortalized in the form of a black-and-white photograph on the Uphaus Bakery wall. It’s an image of a windmill that serves a dual meaning for the bakery’s owner. First, and most obviously, it’s a reminder of her birthplace, but she says it’s also homage to the machine that originally transformed grain into flour. When the family decided to uproot and move to the United States, Alexandra followed but eventually returned to the German town of Höxter, where she worked as a baker’s apprentice. There, she learned the secrets of German bread making, everything from the proteins in flour and their relationship to kneading to the fermentation process of yeasts and how they are affected in different environments. But even a valuable education could not distract her from her desire to be near family. “I came back to Germany, but it was not the same. In the time I had left, all my friends had gotten jobs and left the city,” she recalls. By now, her parents had become major shareholders and active employees at a pet food company. Alexandra once again returned to the United States, this time for good. But there was one move left, when her parent’s company was relocated to Kettle Falls. Kettle Falls, though diminutive in both area and population, supports a co-op that rivals Spokane’s Main Market, and is also home to its own brewery and coffee roaster, Crandall’s, which is currently served at Uphaus. And with so many farmers within a stone’s throw, the seasons bring a bountiful harvest of über-local fruits and vegetables that Uphaus bakery plans to put to good use. “We’re still looking for a local grower of sour cherries, though,” Alexandra says. Practically inedible in their raw form, these tart fruits complement the creaminess of a custard or the earthiness of chocolate, especially after spending a long spell in a vat of kirschwasser. The future will bring more varieties of bread and catering, if there’s a demand. But in the meantime, the Uphaus family will be bringing sweets usually saved for family gatherings and special holidays to the community on a daily basis.